In this digital age, setting up a blog has become a popular business plan. It is a fantastic way for you to make money, whilst operating out of the comfort of your own home. If your blog has already achieved more than you could have ever imagined, now might be the time to take the next step. Recruiting new workers is a brilliant way for you to do this. In addition to lightening your own workload, it will also help you to speed up the production of your content. Rather than hiring the first person, you come across; you will need to complete the following six steps. 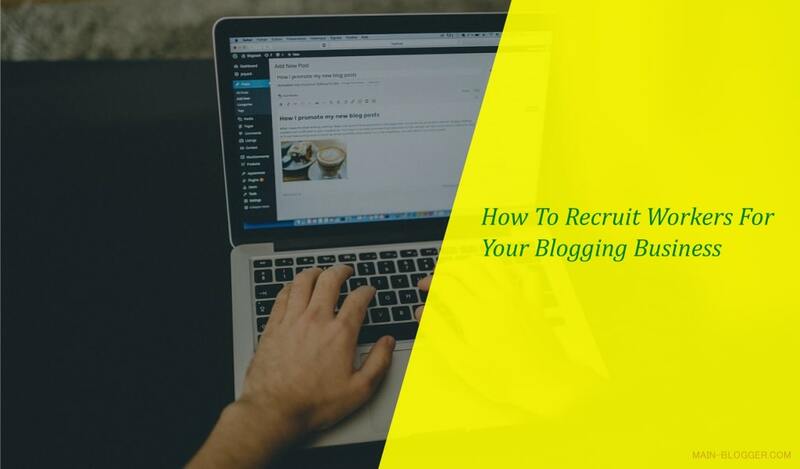 If you are thinking about bringing in new workers to your blogging business, it is likely that you are already considering expanding the focus of your blog. If not, you definitely should be. In order to increase your online following, you will need to tackle a wide range of subjects. Of course, they should still be relevant to your overall brand, but there is no harm in experimenting. Writing a list of all the areas that you would like to delve into will help you in your search for the perfect employees. You will also be able to use these topics when you are creating your job post. In fact, you could even ask your potential workers to make speculative applications centered on the topics that they would like to write on. That way, you are making it clear that they are coming into a collaborative environment that is all about creativity and innovation. The next step is to prioritize great writing skills. Although you are running a business that relies on technology, the most important thing is that your content is interesting and engaging. That is why you should not rule out potential employees who struggle with their digital devices. Once you have hired them, you could always train them up to understand the basics. Furthermore, your business will benefit from reaching out to GenX Solutions, as they will be able to take on all of your IT requirements. Instead of forcing your workers to wrap their heads around complex digital issues, you should place your trust in the professionals. That you’re your workers will have the freedom they need to get on with what they do best. Another important recruitment step is to hire a professional photographer. This is a brilliant way for you to dramatically improve the appearance of your blog site. If you want your business to appear professional, you will need plenty of high-quality visuals that capture the reader’s attention. Securing your own photos will also help you to avoid any copyright issues, as all of your content will be original. If you are tempted by the idea of hiring a photographer but don’t know how you will pay this extra wage, you should be on the lookout for budding photographers who are looking to gain some experience. You might even be able to hire college students who are in need of some extra credit. Just make sure that you keep your standards high. You need to understand what separates a good photograph from a bad one. Otherwise, you could be handing over money for images that you could have easily taken yourself. Before you make any important hiring decisions, you should ask all of your potential employees to send in samples. Whether you are contacting writers, photographers, or graphic designers, it is important that you know exactly what you are dealing with. Even if the samples you receive are far from perfect, you should keep your eyes peeled for potential. Or, maybe you have received beautiful pictures that have been captured with a low-quality camera. Why not offer this potential employee an advance on their wages, with the understanding that they will invest in a better model? Keeping an open mind could help you to reduce your costs, as you will be able to identify diamonds in the rough. Not only this, but you will have an increased sense of employee morale, motivation, and loyalty. It is vital to understand the quality of what to expect from a potential employee before you hire them. You will only be able to maintain this positive relationship with your workers if you are able to get your finances in order. As the owner of a blogging business, it is vital that you take responsibility for your company finances. This sense of responsibility will only intensify as your workforce increases. If there are people relying on you for their wages, you need to make sure that you are in a position to pay them what they are owed. That is why you should consider hiring a personal accountant. Alternatively, if you are unwilling to spend any more money, you could take matters into your own hands. You can achieve this by signing up for internet banking and monitoring your money on the go. You will also be able to set up standing orders, which will come in handy if your employees are paid the same amount each month. Or, if their pay varies, you will be able to complete an online transfer in a matter of moments. Whatever you decide, the most important thing is that you don’t take any unnecessary risks. In fact, you should probably set up an emergency bank account so that you can be sure your bases are always covered. Last but not least, you should arrange regular catch ups with your workers. The fact that your business operates remotely should not be an excuse for you to take your eyes off the ball. Instead, you need to make the most of technology and connect with your staff members at least once a week. You should also consider having a big meet up every few months. This might not be possible for all of your workers, as it is likely that most of them will live outside of your local area. However, it is important that you put the effort in whenever possible. Reminding your employees that you care about them and recognize them as integral members of your team, will assist you in taking your business to the next level. If you are going to secure success, you need to have the support of all of your staff.